If you follow my blogging at all, you know that most of the activity that shows up here is related to my activities on campus and community radio. For years I was involved with CKMS in Waterloo. Since I uprooted myself from KW and settled into Hamilton, it's been CFMU 93.3, McMaster's campus station. it gives me and my co-host Adam a chance to share and promote heavy music you might otherwise miss out on. Sure, pretty much everything may be available online these days, but with so much music out there it can be hard to sort through it all and figure out what's worth checking out. We can give you a taste and hopefully turn you on to the kinds of artists and songs that have you saying, "soooo good!" You may not love everything we play, but if you end up loving some of it, and if we can introduce you to something you haven't heard before, well that's enough for me. is, to some extent, "underground," but the two special features on our show allow us to step out of even metal norms to some extent. "Simulated meat" gives us a chance to challenge conventional definitions or understandings of what metal is and where its boundaries lie. Our newest "global metal" feature let us highlight bands from parts of the world not normally associated with metal, or from outside the privileged nexus of North America and Northwestern Europe. Our weekly Wednesday night slot on CFMU also gives us a chance to promote local events – mostly metal concerts in Southern Ontario, but important charity and community-based activities as well. We advocate social justice where we find the chance, and that includes not just ethical relations between people but also humans and animals, and humans and the environment. Well, that's what we're about, but CFMU has so much more going on than just our two-hour metal show. I have heard shows on Aboriginal healthcare initiatives, the history of mental health peer support and survivor groups in BC, new AIDS-treatment research being developed by professors at McMaster, medical marijuana programs in Canada, and so many more fascinating and important issues that are under-examined in mainstream media. Plus the music – so much variety! I'm particularly partial to The Waiting Room (progressive and psychedelic rock), but it's always a treat to tune in and hear things outside my musical comfort zone and be reminded that there is so much good music circulating in other genres as well. Why am I writing all this now? Because tomorrow CFMU is kicking off its annual fundraising pledge drive, Raise Your Voice. CFMU is a non-profit organization which relies on volunteers, student fees, and community donations in order to operate and keep providing an alternative broadcasting voice here in Hamilton – one that (thanks to ye olde internet technology) reaches out to the rest of the world. Please help spread the word. Come out to our fundraiser rock show on March 7 at This Ain't Hollywood. 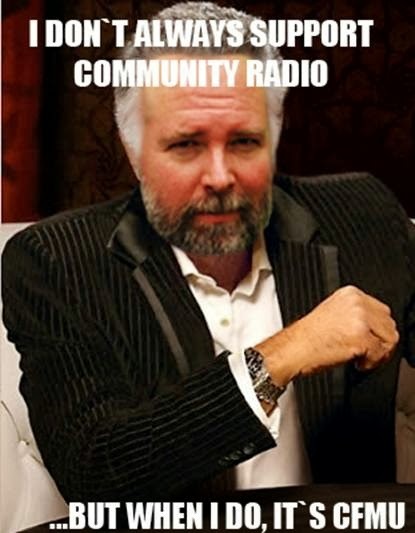 And if you can, donate (http://cfmu.mcmaster.ca/app/promotions or 905.528.9888). Campus/community radio deserves your support.